I want to use this opportunity to apologize to Allbloggingcoach readers and my friends for not been upright with publishing. Actually, I had an examination which I needed to prepare for, and I’m happy to be back. Google plus has been one of the strongest way to drive referral traffic lately. Just a few days ago, one of my blog readers from another niche mailed me that how can he get traffic from Google plus. It was as if something pinched him to ask such a question. Social media sites like Google plus is one of my favorite sites that has been increasing my blog traffic stats and I enjoyed investing my time to share my posts and also gather quality readers as well. Today, I was going through my post archive and I stumbled upon one old unfinished article that I wrote about smartly driving traffic from Google plus. This is an article that met the test of time when it comes to getting traffic from Google plus. I’m going to share those smart ways via this post and I hope you’ll all love it. 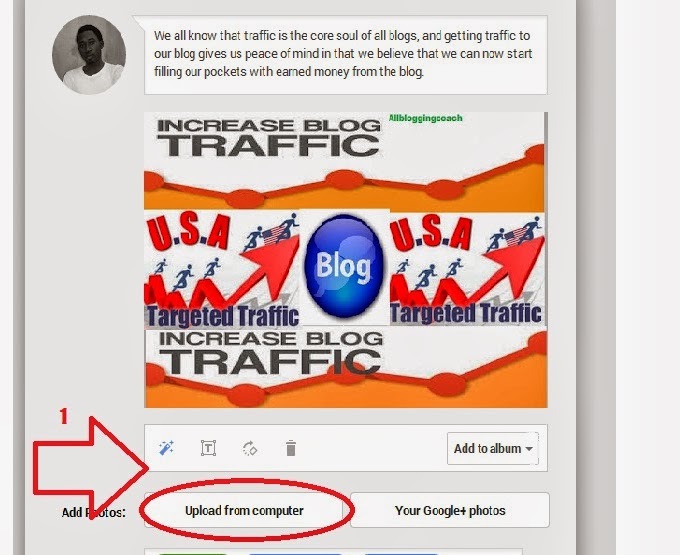 I bet it with you, joining communities on Google plus is the best way to start with getting traffic from Google plus. We have a lot of communities that are related to your niche which you can always join. For instance, if you have a blog that teaches how to sow, or an entertainment blog, you can search for entertainment with the search bar and the result will bring all entertainment related pages, account and communities which in essence you join the communities related to your blog. I’ll advice you to join not more than 5 communities so that you’ll be very active in the community. It is not about how many communities, but how active you are to make your visibility known. So when you are done with joining of communities, then you can now follow the send point. It has been said that images speak a lot more than words, which is very correct. Sharing blog post links is the common way by which most webmaster get their post across on the social media sites which is not that right. We need a change to attract more readers and which is why the use of images is very important. Below is a format of how you can share your blog posts and it‘ll attract more readers than you thought. 1. Just put a Heading and apply some formatting to it. 4. Then now attach a high quality and conspicuous image with the post. This will sure help you make the post go viral. Hey! You need to pay attention here because this aspect is very crucial. I believe you know what we call #harshtag? When we talk about #harshtag, the first thing that should come to your mind is the ability to use “#” to bring out a particular word from many sentences, and most times this word is always our keyword. So when I talk about using #harshtag with your keywords in the post, then you should know I mean what I’m saying. #harshtag plays a very important role in fishing out your keywords on Google plus. For instance, if your keyword is “make money” and you’ve already #harshtagged the keyword before you share it on Google plus, immediately anybody request for make money on that platform, your post will be among the listed search. This is very important and I believe you’ll start making use of it. This is where we will move a bit back to the first point. Remember I told you to join some Google plus communities. I recommended like 5 of them, so that you’ll be very active. Targeting the right audience is very important when it comes to getting traffic from Google plus because this increases the interactivity and also conversion. Google plus has given us the privilege to create different circles and we can add different people to different ones to share our posts. Majorly people do share their post with public and individual circles, but with the advent of circle creation and community input, you have the larger medium of sharing posts. When writing a post for you readers, it is very important to use stylish lettering. What do I mean by this is that you need to stylize your text to grab the attention of your readers. Guess you should be able to apply this trick on post why sharing them on Google plus. 1. Bold: always try and Bolden you targeted keyword, because it will help grab viewer’s attention. 2. Italics: There are some sentences or quotes that require being in italics form, this form is a way to show your readers that the particular sentence or quotes are important. 3. Bullets: I believe lots of writers make use of bullets because it adds more value to your content. You can as well use bullets when sharing your post on Google plus, all you just have to do is to hit your space bar, enter a hyphen, and then hit the space bar again. This will definitely serve as a bullet and it can help you to add more lists to your post. I can strongly guarantee you a success if you follow these stated points. This particular point is very important because it capped other point that I’ve discussed earlier. Readers love to read, comment and they also love to get appreciated by you also going back to read and comment on their blogs. This is how I handle commenting and sharing on Google plus. I have a specific day of the week that I have my blog promotion on Google plus. So whenever I share my post, I picked all the post showing on my screen and I’ll +1 this, then later I’ll now pick 5 out of those post to comment on them. This method works very fine for me because I was able to plan my days. I think it’s very essential to have promotion plans if you really want to make your blog URL a household name. Getting traffic from social media sites is as easy as the Google plus tutorial I’ve just given; all you have to do is to plan your days to promote your blog and to know their proper use. Now it’s your turn to share your experience with me. 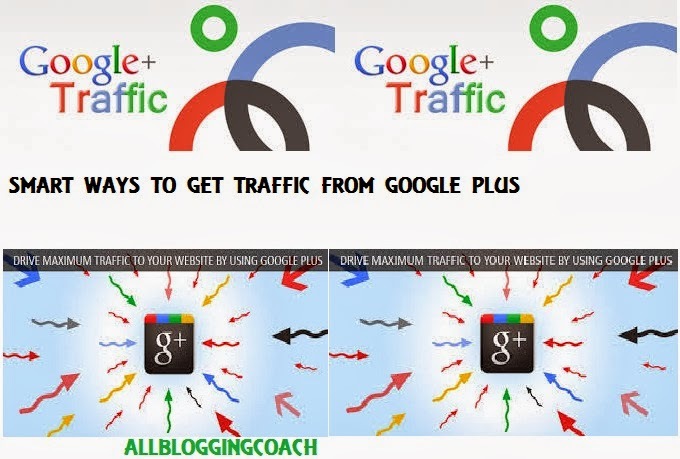 Please tell me how you make use of Google plus and other social media site to generate traffic. I’ll be glad if you can share your knowledge with my readers by using the comment box. Thanks.